I first went in search of Job’s tears a couple of years ago when a reader recommended it as a gluten-free replacement for barley. After striking out at the local natural foods store, I thought for sure I’d be able to buy some on the internet, but a Google shopping search pointed me to a page full of rosary beads and skin whitening cosmetics. Clearly, the elusive Job’s tears had other uses than just as a simple grain. I finally stumbled upon a bag of hato mugi, the Japanese name for Job’s tears, quite by accident in a Korean grocery store. I bought a bag, brought it home, and stuck it in my freezer (which is where I keep my grains since an Invasion of the Pantry Moths a few years ago). There were no general directions in English on the package, just a recipe for making it into porridge, which isn’t what I wanted to do, so I left it to age gently in the freezer while I did some research on cooking time and water to grain ratio and anything else I needed to know. And like my Google shopping search, I once again found nothing relevant. So I did what anyone else would do: I just guessed. I put a half cup of the grain into a pot with 2 cups of water and cooked it until it was soft, about an hour. Then I drained it and threw it into the dish I was making for dinner. 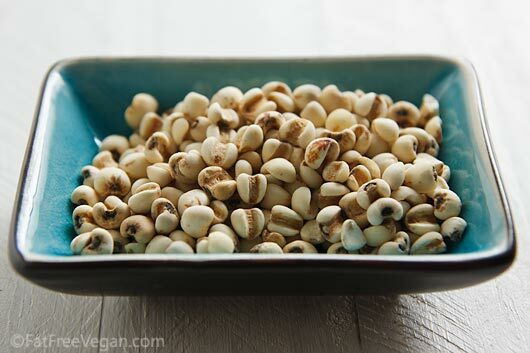 Job’s tears (Coix lacryma-jobi) is a tall grass that has been cultivated in Africa and Asia for centuries. Its name comes from the shape of the unhulled grain, which suggests a teardrop, an ebony-color teardrop. Throughout the world, rosary beans and other prayer beads are made from unhulled Job’s tears. The grain is also used to make attractive, durable, and inexpensive necklaces. Wood goes on to say that Job’s tears, one of the few nonhybridized grains available today, has to be imported because it doesn’t grow in North America. Unpolished, it has a reddish-brown color, but when hulled and polished, it looks a little like pearl barley with a deep groove down one side. Job’s tears should be picked over before cooking and any darker or damaged-looking grains discarded because they will give a bitter taste to the whole pot. 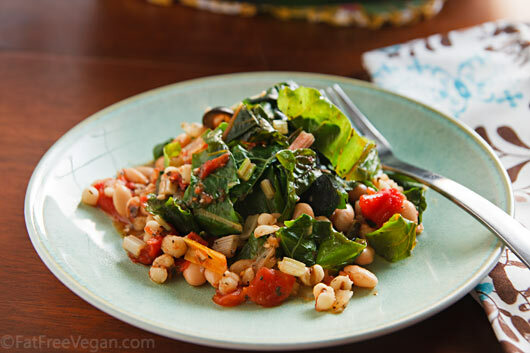 I harvested the last of my winter crop of rainbow chard last weekend and wanted to use it in a quick skillet dinner with white beans. 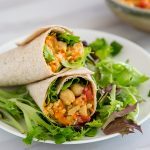 I thought it could use a hearty grain, something bigger than quinoa or millet or rice, something that wouldn’t get lost among the leaves and beans. That’s why I reached for my unopened bag of Job’s tears, but any larger grain will do. If you can’t find Job’s tears, try it with barley or, if you’re gluten-free, buckwheat groats or canned hominy. Swiss chard is like two vegetables in one. 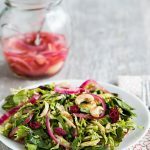 Most recipes recommend removing the stems and saving them for another use, but very few recipes exist for chard stems alone, so they often go unused. I like to use the whole vegetable in my recipes. The stems need to be cooked longer, so I chop them and cook them along with the onions at the beginning and add the leaves near the end. Cook the Job’s tears or your choice of grain according to package directions. For Job’s tears, I used 2 cups of water and cooked, covered, on low for an hour. Then I drained the water off before proceeding with the recipe. Remove the stems from the chard just where the leaf meets the stem. Chop each stem into 1/2-inch pieces and set aside. Slice the leaves into 1/2-inch slices and keep separate from the stems. Heat a large, non-stick skillet over medium high heat. Add the chard stems and the onion and cook, stirring regularly, until the onion begins to turn golden. Add water a tablespoon at a time to prevent sticking, if necessary. Add the garlic and red pepper flakes and cook for another minute. 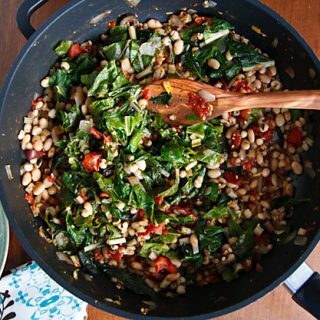 If chard is unavailable, kale makes a good substitute, though you may not need the balsamic vinegar, which I use to cut the bitter flavor of the chard. Thanks for that information! I’m particularly interested in trying the milk made from job’s tears. Do you use the polished grain for that? You can use both polished and unpolished grains, polished grains make a “cleaner-tasting” milk(with a color resembling that of real milk, so lots of people prefer it that way), while whole job’s tears leave a nuttier aftertaste. I’ve never heard of these before. I’ll have to check them out at one of the Asian groceries around me. Would love to hear some more recipe ideas for using these! I love that even though I consider myself pretty out there with my vegan pantry, that you always introduce me to something I have never even heard of!!! Hi Susan, I have a book from Amazon.com “Amazing Grains- Creating Vegetarian Main Dishes with Whole Grains” by Joanne Saltzman and it’s full of recipes calling for Job’s Tears. I haven’t had any luck finding them at any of the natural markets in my area. I do occasionally shop at Korean markets, so I will definitely check there. Thanks for the tip about that book, Jody! I just picked up Amazing Grains on Amazon for $4, including shipping. I’m looking forward to seeing what she does with Jobs’ tears. Wow! I’ve never heard of Job’s Tears before. I’m excited to find some and try them out. I’ve been missing barley so much since going GF. Found them on the Eden Organic site. You were right on the cooking time. They recommended toasting first. Not the kind you can eat, at least not in stock when I search for them. This was really interesting about the Job’s Tears, and the skillet dinner looks great too. 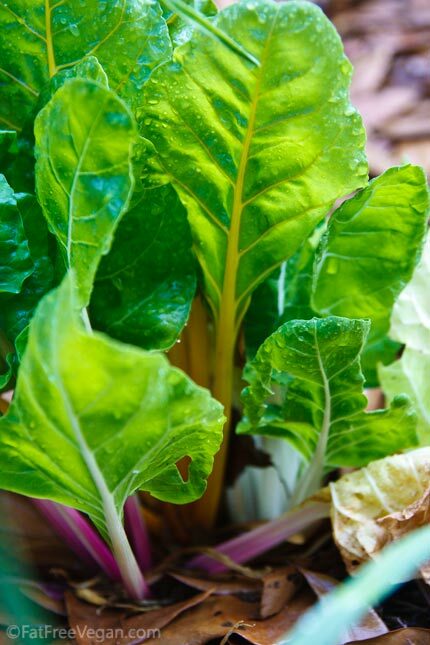 Your chard is gorgeous. I think I might try a version of this with kasha– as always, you’ve given me some good information and ideas, and mouth-watering photos, too. Susan, thank you for writing about Jobs Tears. I have had the same package in my cupboard for months and made one tentative foray into using them. I too realized they were stripped of their most nutritious outer part. Just like I only eat brown not white rice, I would love to find the unpolished variety of this grain. Have you found any source for it? Thanks! I haven’t found it yet, but when I do, I’ll post a link to it here. Like you, I think the polished kind is more processed than I want. Thanks, Susan! Not knowing how to cook them, I made mine Job’s Tears in a rice cooker. Since it seemed to be like barley, I put a little extra water in than I normally do for rice. It worked well. It’s such an interesting grain! I admire your determination, Susan! Thanks for sharing a beautiful recipe and new-to-me ingredient. I’ve seen something like this at the Asian grocery store, but thought it was just some form of barley. I’ve never heard of Job’s Tears – love that name. Love this recipe. Have never heard of Jacob’s tears so will hunt some down if I can. 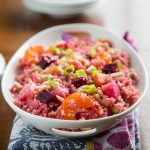 The photos of your rainbow chard made my mouth water! I’m so excited about growing my own this year. Thank you for the info on Job’s tears. This recipe looks delicious, I would definitely go out of my way to find them to use. Great recipe! I have been Vegan for one year now and loving it. 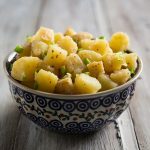 It has been a little more challenging lately because I have cut my grain and soy intake, just to see what it is like with some foods that are know for imfamaation. Do you find most people are eating for health or animal rights. Made this tonight using barley in place of the job’s tears. Delicious – thanks for the recipe! This is my first time to encounter Job’s tear and it fascinates me. I am curious about the taste. 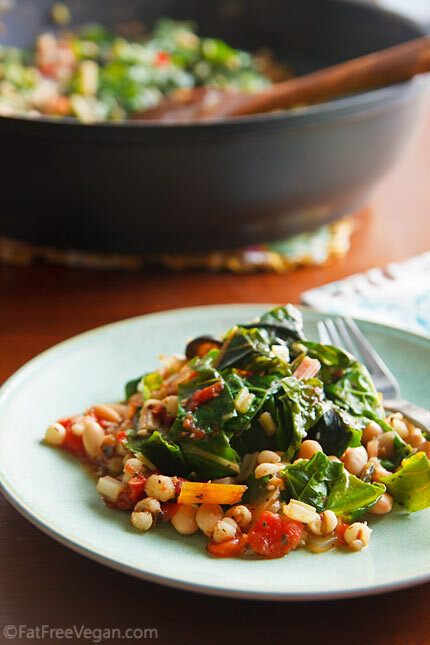 What do you think is a good substitute for Swiss Chard? Almost any kind of greens will work, but I think kale would taste the best. Interesting! These grow like weeds along many of the streams on the Big Island. As children it’s one of the things we would make necklaces out of to sell to tourists. I live in Los Angeles now, but I must find some to cook with! I bought (polished) Job’s tears at a Chinese Herb Store. The Proprietess suggested washing them in water, change the water then soak 10 minutes wash rub fingers scrub them then drain, add new water and repeat this 2 more times. Then simmer 1 hour, toss water. Then add to a soup. Very important to cook well for proper digestion. I found another package at Vietnamese Grocery Store and the package had a warning: contains sulfites. I suppose this is why the soaking and washing is important. I pressure cooked them one hour instead of simmering, and they were nice and soft. WEB MD has a note to stop eating them 2 weeks before surgery due to lowering blood sugar efect of Job’s tears. You comented in your article that Job’s Tears do not grow in the US. A number of years ago when I was living in central Texas, I did grow Job’s Tears one year. I don’t remember where I got the seeds, but they did grow successfully. At the time, I was thinking “beads” but did not know they were edible. Wish I had known! I think they would grow here in Coastal Mississippi because the temperature is right, but they might not because of our high humidity and relatively heavy rainfall. Carol C.
I made this for dinner last night, but didn’t have any Job’s tears or barley, so I used a small amount of brown rice. This was a seriously easy and delicious meal! Thank you for this wonderful recipe for Job’s Tears. I just have to share with you an experience I had of Job’s Tears. We have a wonderful International Market here in Greensboro, NC and every time I go I try to purchase something I’ve never seen or heard of before. On one occassion I purchased a bag of Job’s Tears. When I got home I put the (high quality, professionally sealed) bag in my pantry – knowing that I would need to do an Internet search for a recipe. Well… I completely forgot about them until about a month later. Needless to say, I was completely creeped out! I have never considered buying another bag – ever – until just now when I saw your article and read that they are GLUTEN FREE! Well… now I’m going to have to – very cautiously – try them again. Thank you for also mentioning the buckwheat groat as being gluten free. Don’t know what that is yet but I am definitely going to go and find some. Thanks again for your article and recipe!!! I enjoy a lot of your recipes, but this week am only cooking from your blog recipes, well, except for Tuesday which is always Taco Tuesday (vegan, of course). Thanks for sharing all of your work with the rest of us vegans. http://jennyhoople.com/about/jobs-tears This woman is growing them in the US. It is available everywhere here, in Thailand. I was about to cook some up that I purchased a few months ago, when my wife noticed that the unopened bag was full of ants! Of course, that is not much concern to her, since insects are part of the national diet here, but I think I will try to pick out most of the ants before cooking. I am trying to incorporate more beans and nuts in my diet and Jacob’s Tears look like a nice addition. Thank you for the recipe. I am not vegan nor vegetarian, just trying to decrease the amount of animal products I eat. I found your recipe while looking for something to do with the Job’s Tears I bought a few months ago. Tonight was the night for making it….and I really liked it! My husband enjoyed it too, so I hope to be able to make it again. Swiss Chard has just been in the store for the last couple of years here, I never see kale at all. Is there another leafy vegetable you’d recommend when Swiss Chard is finished for the year? I think that any leafy vegetable can be used instead of chard, so just substitute any one that you can find locally. I’m happy you enjoyed the recipe! This sounds really good! I’m wondering, though, why the recipe has such a high sugar content? There’s no added sugar in the recipe, so where does it come from? That may be an error. I’ll try running it through the nutrition software again and update it if necessary. Thanks for noticing! I ran the numbers again, and while my current software doesn’t come up with exactly the same numbers, the sugar is still in the 8-9 gram range. Most of it comes from the tomatoes and onion (2.28 and 1.59g respectively) but the Job’s Tears contribute 1g, the chard about .8g, and the beans about 1.38g. There’s trace amounts in just about everything. I can’t guarantee that my nutritional analyses are completely accurate; they’re meant to give a general idea about the makeup of the recipes. Just made this for dinner and it was really tasty. Being from China I would never think of cooking Job’s Tears this way! Unfortunately my husband said that chard tasted like dirt… Which is O.K. because there would be more for me! Hi! You might need your source of Job’s Tears, very organic from the Philippines. Just look for Job’s Tears PH in Facebook.